Whether it’s poking your nose under a rock to check for that next monster cray or going for an always epic night dive to check out the nocturnal sea life, every diver should carry at least one torch. A back up is also always a good idea, as well as a necessity when night diving. 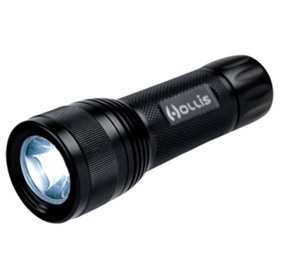 The Hollis LED Mini is a great torch for either purpose, hunting for crayfish or as a backup at night. It’s compact, and for its size carries a lot of “oomph”. The simple click on, click off mechanism is so straight forward that even my cat could use it. The simplicity and durability of this torch means you’ll experience minimal flooding (if you’ve ever had a flooded torch, you’ll understand this pain) as well as a bright beam from a compact piece of kit. See below for the specs. Once you’ve gone head first into that cray hole with your awesome torch and returned safely with your catch, you’ll need to be sure he’s up to size. Included in the prize for the month of August will be a standard aluminium cray measure. Ensuring your catch is legal will save you a potential headache, as well as giving the wee fellas a chance to grow up to size for good eating. The aluminium measure is tough and can be clipped to your gear for easy underwater measuring. Crays are spiky little buggers, if you’ve ever tried grabbing one bare handed you’ll understand this pain. This is their defence mechanism (one of many) and luckily for us we can combat this using Kevlar palm gloves. Kevlar stitching is durable and able to withstand those pesky cray spikes. In your kit you’ll find a pair of Oceanic Kevlar gloves. These gloves are warm enough for NZ waters, as well as being tough enough to tackle the biggest of crays. And finally, as a cherry on top of this badass sundae, you’ll need somewhere to put all these crays you’ll be catching. An NZ made, Dive HQ Catch Bagwill do the trick for sure. 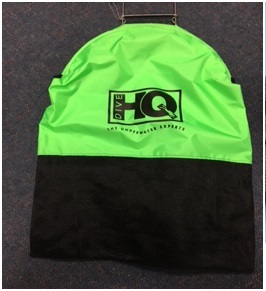 This heavy duty catch bag will retain your catch, saving you hanging on for dear life to a frantic crayfish. Nothing worse than doing the work only to discover your dinner has snuck out the back way. Spend $100 in store anytime during the month of August to go in the draw! Notifications, Special Offers Boat, Cavalli Islands, Dive, Dive Gear, give away, new zealand, PADI, PADI Dive Instructor, PADI Rescue Diver, Poor Knights, Rainbow Warrior, Sidemount, Tertiary Course, White Island, Wreck Diving. permalink.